There is an old saying, “God created the Grand Canyon, but he lives in Sedona.” The Sedona region is home to extraordinary red rock formations, natural arches, majestic pinnacles, cliffs, gorges, sculpted canyons, mesas with panoramic views, ancient Indian ruins, plus year-round creeks and swimming holes. Sedona offers an abundance of outdoor activities, and hiking is one of the most popular. 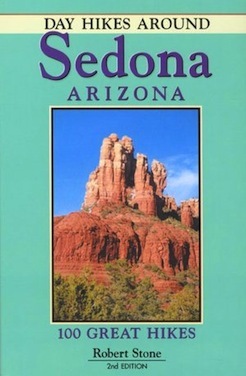 Day Hikes Around Sedona, Arizona (an award winning book from the Outdoor Writers Association of California) is a comprehensive guide to the extensive network of trails throughout this beautiful area. These 100 hikes include trails to all the best-known rock formations, as well as secluded trails that travel down remote canyons, across vast plateaus, or lead to archeological sites. Oak Creek gently cascades through town, leaving a corridor of lush vegetation that contrasts with the eroded red rock landscape. Interconnected valleys, canyons, and mesas offer abundant opportunities for hiking and exploration.